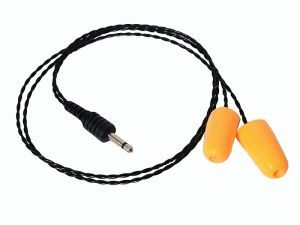 Block out that engine noise with these Professional Series Pro Foam ear bud speakers with 1/8" mono plug. Utilizing a hearind aid transducer instead of a standard speaker, expect unmatchable clarity from these earbuds. These foam earbuds provide better noise reduction than the semi-custom tyep ear pieces. *** You can also peel the foam off and have them inserted into full custom ear moulds for the ultimate inrace communications.